VillageReach (www.villagereach.org) was our top-rated organization for 2009, 2010 and much of 2011 and it has received over &dollar;2 million due to GiveWell's recommendation. In late 2011, we removed VillageReach from our top-rated list because we felt its project had limited room for more funding. As of November 2012, we believe that that this project may have room for more funding, but we still prefer our current highest-rated charities above it. VillageReach (www.villagereach.org) aims to improve the systems that distribute medical supplies to rural areas in Africa, so that life-saving supplies get to those who need them. Its programs include both technical support staff and changes in logistical setups (such as moving from a system in which health clinics collect their own supplies to a centralized delivery system). Our research on VillageReach has focused on its Dedicated Logistics System (DLS) program in Mozambique (reasons for this discussed below). It ran a pilot of this program in a single province in Mozambique from 2004 to 2007 and began, in 2010, to scale up the project to additional provinces in Mozambique. The evaluation of the pilot project was one of the best evaluations we have seen from a charity, and it provided suggestive but not conclusive evidence that the project saved lives cost-effectively. The scale-up has experienced challenges and there are indications that it will not be as effective as the pilot project. In addition, it may be more difficult to determine the impact of the scale-up project; key data that was collected for the pilot project has not been available for the scale-up project. VillageReach has demonstrated a commitment to sharing results of its work publicly, enabling it and others to learn from both its successes and failures. Details on VillageReach's work is also available on our VillageReach updates page, on our blog, and in our notes on our visits to VillageReach's programs inhealth Mozambique and Malawi. See also, older versions of this report. Our research on VillageReach has focused on its work in Mozambique. Since 2009, when we first started following VillageReach's work, its Dedicated Logistics System (DLS) program in Mozambique has been the primary use of unrestricted funds (this may be changing). It implemented a pilot project in the northern Mozambican province of Cabo Delgado from 2002 to 2007 focused on delivering vaccines, and also briefly ran a similar program in the neighboring province of Nampula. It then handed off the projects. In 2010, it resumed its DLS system in Cabo Delgado, and then expanded the system to three additional provinces: Niassa, Gaza, and Maputo province.3 It has expanded the system to deliver additional supplies, particularly diagnostic tests. VillageReach's other programs have generally been fully funded by funds that a donor has restricted to a particular project, not by unrestricted funds,4 and therefore, we have not researched the details of these projects. VillageReach, which was founded in 2000,5 conducted a demonstration of its vaccine delivery system in the province Cabo Delgado in Mozambique from April 2002 to March 2007.6 The Cabo Delgado project officially became the local government's responsibility in 2007,7 but VillageReach resumed responsibility in mid-20108 due to problems under government management. For more detail on recent activities in Mozambique, see our updates on VillageReach. Kwitanda Community Health program: VillageReach seeks to strengthen health service delivery in the Kwitanda area by employing additional health workers, distributing insecticide-treated bednets, purchasing supplies for the health center, building water and sanitation infrastructure, testing patients for tuberculosis, and providing bicycles for health workers. The program is fully supported by a private donor. Information and communication technology for maternal and child health: The project, which is funded by a grant from Concern Worldwide, has three parts: a hotline to answer health questions from pregnant women and new mothers; text message alerts with pregnancy tips; and an appointment system for health centers to reduce waiting times. This section focuses on VillageReach's Dedicated Logistics System (DLS) in Mozambique. It discusses the pilot project in Cabo Delgado, its hand off of its work in Cabo Delgado to the government and in Nampula to another organization, and its scale-up to other provinces. In its evaluation of the pilot project in Cabo Delgado, VillageReach tracked the progress made in administering basic immunizations. Such immunizations are a proven, cost-effective way to improve health and save lives in the developing world (more at our report on immunization), and so success in increasing immunization coverage - alone - likely constitutes, in our view, success in saving lives. Below we examine evidence that VillageReach's pilot project caused vaccination rates to rise in Cabo Delgado. We believe the evidence is consistant with VillageReach causing substantially improvements in the immunization rate in Cabo Delgado, but that the evidence is not conclusive. One of the key indicators that VillageReach tracked during its pilot project in Cabo Delgado was the percent of health centers that experienced a stockout of one or more vaccines in a given month. Over the course of the project the number of health centers experiencing at least one stockout fell substantially. Unless otherwise noted, all data and analysis in this section is based on the pilot project dataset VillageReach sent us. We are not cleared to share this dataset publicly. Details on the data we used to create this chart are at our report on our re-analysis of VillageReach's pilot project data. 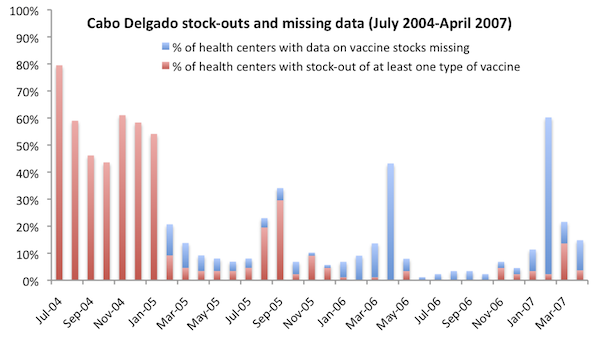 In the above chart, we excluded health centers with missing vaccine stock data from both the numerator and denominator of "% of health centers with stockout of at least one vaccine." 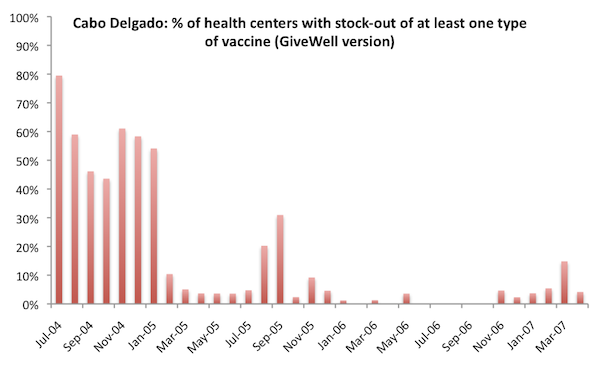 Since stockout data was generally collected during vaccine deliveries23 and failure to visit the clinic was a primary reason for missing data,24 we would expect health centers with data missing to be more likely than other health centers to have a vaccine stockout (data was collected at the time vaccines are delivered), this assumption may show an inflated picture of VillageReach's impact. 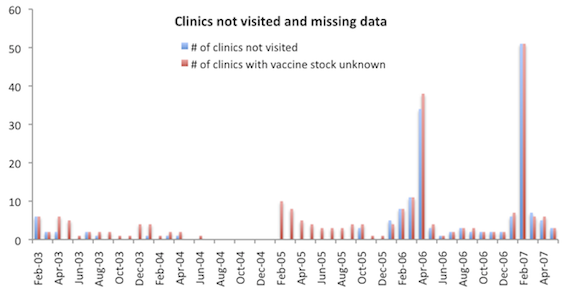 On the other hand, VillageReach told us that vaccines sometimes reached clinics without VillageReach staff visiting,25 and we note that periods of high missing data were not followed by high stockouts in the chart below, as might be expected if a missed VillageReach visit meant no vaccines reached the clinic. Below we show the percentage of health centers with data missing in each month, as well as the percentage of health centers with a stockout of at least one vaccine. The denominator in this chart includes health centers with missing data. VillageReach's data set includes data from February 2003 to May 2007. The charts above, in attempting to recreate the stockout chart created by VillageReach, only cover the period July 2004 to April 2007. For greater context, we show the full date range below. VillageReach notes that prior to mid-2004, data was not gathered with a standard form, as a result "data points gathered aren't consistent for all data points all months during that time. "26 It is not clear to us what this means for stockout data specifically. Before 2005 stockout rates were on the whole, but not consistently, high in comparison with after the start of 2005. This observation supports the idea that stockouts were a common problem prior to VillageReach's intervention, but also suggests that it took a couple of years after the start of VillageReach's project for the intervention to be effective. We also note that while VillageReach describes the baseline stockout rate as "almost 80% in 2004,"27 the average stockout rate prior to February 2005 was 53% of health centers. Reports from VillageReach about the problems with the immunization system in Cabo Delgado before their arrival. Changes in immunization coverage in Mozambique's other provinces, particularly neighboring provinces, over this period to put the observed change in context. Changes in immunization coverage in several countries in Africa over this period to put the observed change in context. Changes in immunization coverage in Cabo Delgado following the end of the pilot project. Alternative explanations for increasing immunization rates in Cabo Delgado over the period of the pilot project. VillageReach reports of pre-arrival conditions: VillageReach provides a report of the obstacles to immunization coverage in Cabo Delgado before its arrival. We would prefer to have better documentation of these conditions, but nevertheless, we believe the report offers some support to the idea that VillageReach's services were needed in Cabo Delgado. Frequent stockouts of vaccines in health facilities. Comparing immunization coverage in Cabo Delgado to other provinces: Below we present two studies of changes in immunization coverage in Cabo Delgado compared with other provinces in Mozambique. The first was completed by VillageReach in 2008 and the second is our own analysis completed in 2012 with data that was not yet available in 2008. 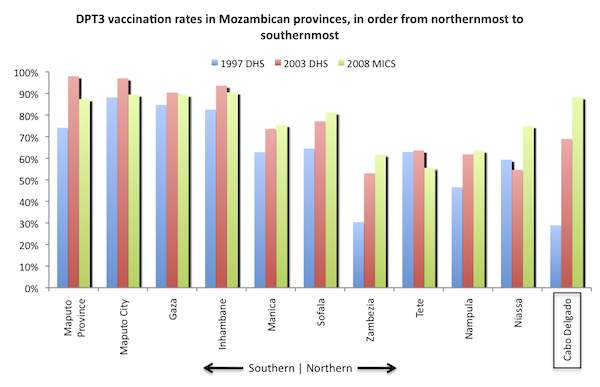 The substantial increase in immunization coverage rates between 2003 and 2008 - a change seen in the neighboring province of Niassa in the MICS data (but not in the data VillageReach's evaluation used), but not in other nearby provinces - gives some reason to attribute impact to VillageReach. Comparison of Cabo Delgado to other areas in the developing world: We took a broader look at changes in African immunization coverage over the time period in question in order to further investigate the idea that Cabo Delgado's improvements may simply have reflected a wider phenomenon. Using the Demographic and Health Surveys (Measure DHS),52 we collected data on DTP-3 immunizations for countries in Sub-Saharan Africa.53 The table below summarizes this data, sorted by the country's arithmetic percentage change in immunization coverage. 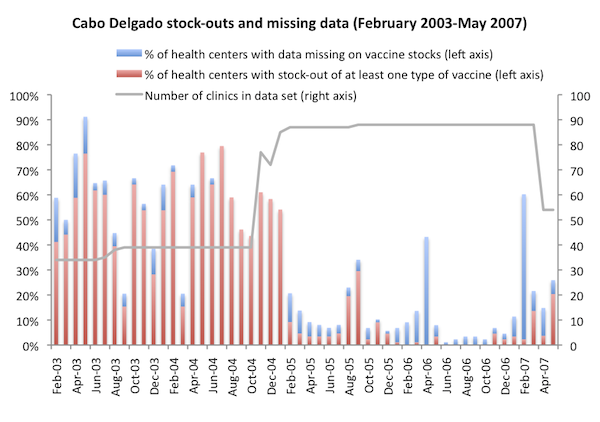 Changes in immunization rates following the pilot project: VillageReach exited Cabo Delgado in 2007. Recently, two different data sets have become available on immunization coverage in the province in 2010-2011. The first is a survey conducted by VillageReach, and the second is the DHS report for 2011. The key question we asked when examining these was whether they demonstrate a worsening of immunization coverage relative to 2008; if immunization coverage had worsened in the years since VillageReach exited (during which time its distribution system was discontinued), this would provide some suggestive evidence for the importance of the VillageReach model. Mozambique introduced the pentavalent vaccine in November 2009. This vaccine, which includes 5 needed vaccines in one, was accompanied by significant vaccine-related promotion activities. Cabo Delgado added 20 additional health centers between the end of VillageReach’s pilot project and the beginning of its scale up work. During the entire period of the pilot project, Cabo Delgado added only 1 health center. Alternative explanations: Alternative, non-VillageReach factors could have led to the increase in immunization. For example, in other charity examinations, there have been cases in which we noted that the charity’s entry into an area appeared to coincide with a generally higher level of interest in the charity’s sector on the part of the local government. As an alternative to prior separate donor-direct funding mechanisms, major international donors started contributing to “common funds” around the year 2000. Common funds aimed to provide general operating support (and greater decision making autonomy) to developing countries’ ministries of health. Provinces could chose how to allocate these funds and the government of Cabo Delgado may have allocated more resources to immunization-related activities than other provinces. Unfortunately, we have also not been able to track down data on how common funds were spent. We believe that the fall in stockouts and rise in immunization rates observed in Cabo Delgado could be attributed to VillageReach’s activities, but it is possible to speculate that the improvements in both provinces were driven by another factor that we do not have full context on. The fact that Niassa, a neighboring province, experienced a large rise in immunization rates (although not to the level seen in Cabo Delgado) over the same period (see chart above) raises the possibility (from our perspective) that non-VillageReach factors contributed to the rise in immunization rates in Cabo Delgado (although it is also possible to speculate that Irish Aid/World Bank funds spent in Niassa increased coverage rates there while the VillageReach program in Cabo Delgado was responsible for the increases in that province). The data suggests that following the discontinuation of field coordinator teams delivering supplies and performing supervision, the districts and health centers are having difficulty reliably picking up supplies, stockouts of vaccines are beginning to occur again, there is some (not statistically significant) evidence that immunization coverage is beginning to fall, and district level budgets are not being maintained for these activities. The fact that VillageReach monitored the program's continuing performance, and has been open about setbacks, is encouraging; but news of program deterioration is cause for concern. VillageReach provided us with data from this project through August 2008,61 and stated to us that the data became unreliable (due to internal contradictions) after that point.62 We have not received clearance to post the data publicly. Overall, it showed encouraging trends that resemble the trends outlined above: increasing numbers of immunizations and substantial drops in the rates of stockouts and other logistical problems. However, because of the fact that the data terminates at an apparently arbitrary point, we have serious doubts about the impact of this project. This project's expenses, overall, were equal to about 20% of the expenses associated with the pilot project. Based on multiple conversations with VillageReach representatives, it is our impression that the very limited role VillageReach took in this project is not representative of VillageReach's typical or future activities. Baseline vaccination rates are higher. The four provinces that VillageReach is working with are starting at fairly high levels of vaccination coverage,64 so the scope for improvement is more limited than it was in the pilot project. We have not seen similar data on distribution regularity for the pilot project, but the fact that regular distributions did not occur in Cabo Delgado for the first ~1.5 years of the project and distributions were only to part of the province in Niassa and Gaza for most or all of the project, indicates that the project is performing below expectations. The reasons for these problems are discussed in our updates on VillageReach. We have not seen baseline stockout data from any province. The program is at different stages in each province (for example, VillageReach started work in Cabo Delgado in June 2010 and in Maputo in December 2011). We would prefer to review disaggregated and raw data to determine whether the results are consistent across provinces. We would also like to see data on "% of centers with at least one vaccine stockout," which was a key indicator in VillageReach's pilot project. This data was not included in the information VillageReach shared with us. More details on the scale-up project are available in our updates on VillageReach. We do not have a current estimate of the cost-effectiveness of VillageReach's work. We do not believe that we have a sufficient understanding of the impact of VillageReach's Cabo Delgado pilot project, Mozambique scale-up, or other activities supported with unrestricted funding to give an estimate of cost-effectiveness. Because we do not currently rank VillageReach among our top charities, we have elected not to prioritize further work on this. We published a cost-effectiveness estimate for VillageReach in 2009; we no longer have confidence in this estimate. We do not have a current estimate of VillageReach's funding gap. Because we do not currently rank VillageReach among our top charities, we have elected not to fully investigate VillageReach's funding gap and cannot provide a specific estimate at this time. Further discussion in our February 2013 update on VillageReach. Revenue and expense growth (about this metric): VillageReach reached a large five-year, &dollar;3.3 million grant agreement with the Gates Foundation in 2004,69 which explains the large jump reported revenues in 2004.70 Both revenues and expenses have grown since a low point in 2007 (possibly due to the fact that VillageReach had completed its work in Mozambique by that time and was largely focused on reviewing and evaluating that project). Revenues were high in 2011 in a large part due to GiveWell's recommendation of VillageReach. Assets-to-expenses ratio (about this metric): At the end of 2012, VillageReach had less than a years worth of expenses on hand. Expenses by program area (about this metric): We have not sought recent information on VillageReach's program budget. Expenses by IRS-reported category (about this metric): VillageReach maintains a reasonable "overhead ratio," spending approximately 75-85% of its budget on program expenses. See our updates on VillageReach. See discussion in our 2011 review of VillageReach. "In March 2002, a 5-year pilot project (extending from April 2002 to March 2007) was initiated. In the project, the FDC and VillageReach, in coordination with MISAU, the Expanded Program on Immunization (PAV4) and the Provincial Directorate of Health (DPS) of Cabo Delgado, distributed vaccines, gas, medicines and other essential medical supplies each month to all the heath facilities providing immunization. This included rural health facilities, which were often isolated from the normal distribution systems due to insufficient public infrastructure." Kane 2008, Pg 10. "In the project, the FDC and VillageReach, in coordination with MISAU, the Expanded Program on Immunization (PAV4) and the Provincial Directorate of Health (DPS) of Cabo Delgado, distributed vaccines, gas, medicines and other essential medical supplies each month to all the heath facilities providing immunization. This included rural health facilities, which were often isolated from the normal distribution systems due to insufficient public infrastructure." Kane 2008, Pg 10. See our February 2013 update on VillageReach. See VillageReach Mozambique scale-up project overview (July 2010), Pg 8. "VillageReach initially envisioned that DPS authorities in each province would effectively take over responsibility for the operation of the DLS after a period of one or two years… We are now less confident of seeing this phase realized in each of the provinces, owing primarily to the significant funding challenges, insufficient transportation available, and overloaded human resources we have seen the government experiencing." VillageReach Mozambique scale-up project overview (October 2012), Pgs 19-20. "Specific program objectives [include] … Integrate additional key commodities – such as rapid diagnostic tests – into the dedicated logistics system." VillageReach Mozambique scale-up project overview (July 2010) Pg 7. Notes on site visit to VillageReach in Malawi. VillageReach reports this as "DPTHpB," however, the more common way of referring to this vaccine seems to be "DTP/HepB" or the "Tetravalent" vaccine, i.e. a combination vaccine for diphtheria, tetanus, pertussis, and hepatitis B. (See UNICEF Mozambique Immunization Plus which notes, "The national EPI programme was recently bolstered by the introduction of the DPT-HepB vaccine (diptheria, pertussis, tetanus and hepatitis B)." 1. Pentavalent vaccine – DPT/Hep B + Hib – begin introduction (national target objective of 20%), using two doses lyophilized for Hib and two doses liquid for DPT/Hep B to be used also as a diluent. 2. Continue Tetravalent – DPT/Hep B during 2007 (national target objective of 55%), using a 10 doses vial liquid for DPT/Hep B." Government of Mozambique, "Phase 2 Proposal to GAVI Alliance (2006)," Pg 18. According to GAVI country information: Mozambique this proposal was approved for "NVS-Penta" in 2008. Leah Hasselback, VillageReach Program Manager, email to GiveWell, January 27, 2012. VillageReach Cabo Delgado logistics assessment (2002) Pg 9, Table 1.1. VillageReach Cabo Delgado logistics assessment (2002) Pg 10, Table 2.1. VillageReach Cabo Delgado logistics assessment (2002) Pg 10, Table 2.2. "This study used data from the 2003 Mozambique Demographic and Health Survey (DHS 2003) as baseline data. DHS surveys are cross-sectional household surveys that are representative on both a national and provincial level...12,315 households were included in the study...The variable 'DTP 3' was computed using the following variables from the Mozambique DHS 2003 dataset: 'received DTP 1,' 'received DTP 2,' and 'received DTP 3.' 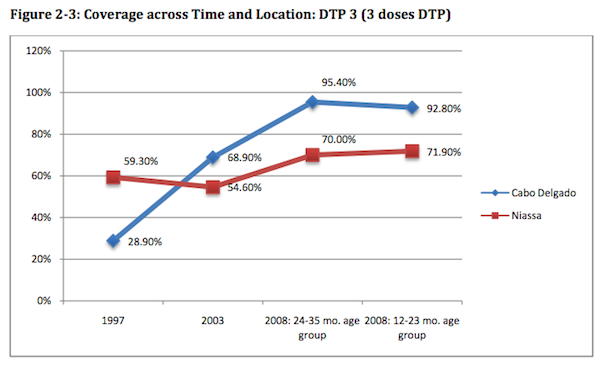 'DTP 3' was defined as those children who received all DTP doses (DTP 1-3) according to card or history." Leach-Kemon, Dionísio, and Taimo 2008, Pg 9. Leach-Kemon, Dionísio, and Taimo 2008, Pg 10. "As part of the evaluation, Village Reach conducted a WHO Immunization 30 x 7 Coverage Cluster Survey in Cabo Delgado in July 2008...For a 'comparison' Province they used the neighboring province of Niassa, which had data from the DHS surveys in 1997 and 2003, and from an EPI cluster survey in 2007 conducted under the auspices of DPS for reasons unrelated to this Project." Kane 2008, Pg 21. Leach-Kemon, Dionísio, and Taimo 2008, Pg 16. Measure DHS Statcompiler. We accessed data through the StatCompiler tool and looked at all available surveys for Sub-Saharan Africa. Leach-Kemon, Dionísio, and Taimo 2008: A July 2008 survey of two groups of children in Cabo Delgado: children aged 12-23 months (likely vaccinated at the end and after the VR project, which ended in Feb-Apr 2007) and children aged 24-25 months (likely vaccinated during the project). VillageReach Cabo Delgado baseline vaccination survey (2010): An April 2010 survey of children 12-23 months of age. None of these children would have been vaccinated during the VillageReach pilot project. "At the outset of the program in January 2010, we had expected to expand the program to eight provinces over a six-year period. However, as the program has progressed, we have determined that VillageReach funding resources for future years is likely to be less than what would be required to operate the program successfully. In addition, VillageReach has come to better understand the limited financial resources of the provincial governments it is working with. Because of periodic delays in the allocation of government funds for the DLS program – and in the absence of other 3rd-party support – VillageReach has decided to limit the program to the four provinces in which it is currently operational." VillageReach Mozambique scale-up project overview (October 2012), Pg 7. The baseline rate of coverage for the third DPT vaccination for VillageReach's pilot project in Cabo Delgado was 68.9% (in 2003) - see above. Cabo Delgado: Overall immunization has fallen only slightly since the 2008 conclusion of VillageReach's work in this province. See our March 2011 update on VillageReach. Niassa: VillageReach's baseline report from Niassa did not include data on DPT coverage (VillageReach Niassa vaccination baseline (2010)). The 2008 DPT coverage rate in Niassa was 75% according to the Mozambique MICS 2008 and the Mozambique DHS 2011 preliminary report reported 83% coverage. Gaza: According to the Mozambique DHS 2011 preliminary report, 76.3% of children between the ages of 12 and 23 months have received all basic vaccinations and 89.0% have received the third DPT vaccination, a commonly used indicator of "vaccination coverage." See our February 2013 update on VillageReach. Maputo province: Based on the baseline study, current vaccination rates in Maputo seem extremely high - significantly above the levels VillageReach used when it estimated the impact of its program (VillageReach has not been granted permission by the government to share details publicly). See our August 2011 update on VillageReach. VillageReach IRS forms for 2002-2008 and VillageReach financial statements for 2009 to 2012. Gates Foundation grant to VillageReach (2004).